What good is flexible exhaust? You are here: Home » News and Events » Products News » What good is flexible exhaust? Q: I was thinking about going true dual on my 92 camera... I saw some flexible exhaust on jcwhitney.com, and I was thinking about getting that, instead of paying someone to do all the pipe work... its 30 bucks for like 25 feet which is definitely enough, so I figure that plus 2 galas packs for 20 each that puts me at 70 bucks... that’s pretty cheap... is that a good idea? A: You get what you pay for, flex pipe should not be used before the muffler, I would only use it as a temporary fix. 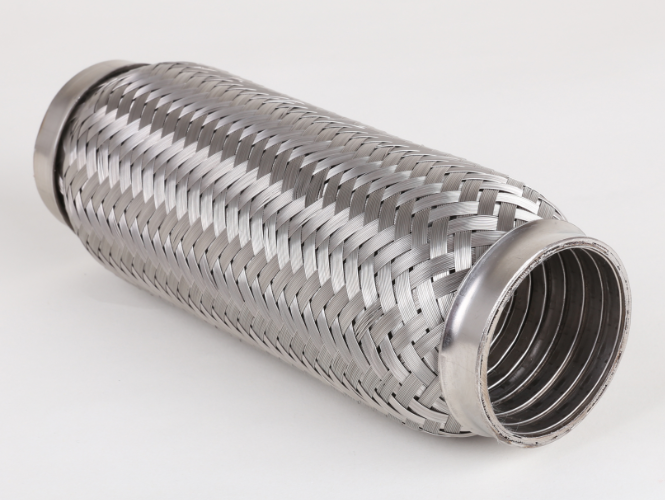 It will work for a while, it is by no means meant to replace a much thicker tailpipe that exhausts the fumes either to the side or the back of the car, flex pipe will not hold up to the wear and tear of a car moving at high speed. A car exhaust gets a pretty tough pounding. If the flex pipe moves it comes in contact any where it goes over or around some part of a frame or axle housing, then vibration wears a hole and the next thing you know, exhaust gasses can leak into the body of your car. If you use flex pipe before the muffler, the heat from the exhaust manifolds will in a short period of time get holes burned into it, and then you have exhaust gases (which are cumulative, and will cause brain damage over time) as a temporary fix to repair rotted or missing tailpipe is ok, if you plan to use it for long term as a permanent exhaust pipe, this is not a good idea. Also you get what you pay for, a 20 dollar glass pack will burn out quickly and fall apart fairly fast. It is better to spend a little more money, get some quality mufflers and exhaust pipe, and do it right once, which will last many years, best of luck whatever you do. Flexible exhaust in spots is good, however, I would still recommend going with primarily solid piping. The flex points, or "Flex-pipes" are designed to allow the engine is rocking motion in the mounts without stressing the exhaust pipes or where it mounts to the head. However, I cannot imagine it would be a good idea to have a complete flexible exhaust system. Not to mention the fact it will be hard to mount 02 sensors in flex piping.